I like to nit pick things. I feel criticism is a good way to improve overall. In the end, though, there is frequently something more than a checklist or a simply distilled combination of factors that make something good or bad. Titanfall is like that for me. I can find plenty of fault with the game, but in the end I do really love playing it. But that doesn’t mean we shouldn’t bring up where there could be improvement. In fact, I think that this is a good path to walk to muse about a more perfect game that could have existed and possibly why this example can rise beyond its limitations where others I feel fall into them. What is this Titanfall thing? 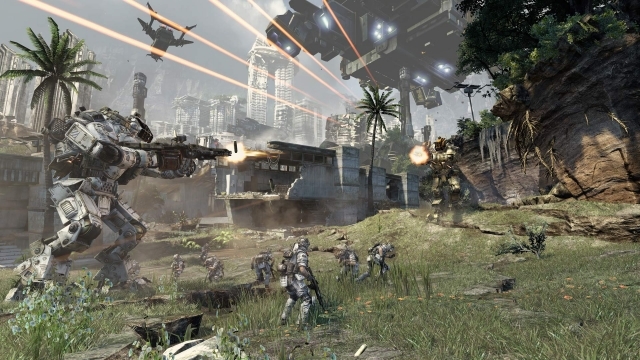 In case you’ve been under a rock or just naturally tune out a lot of commercials or big name things, Titanfall is a recent game from Respawn Entertainment. It is an online multiplayer only First Person Shooter released for PC, Xbox 360 and Xbox One. It proudly boasts a ton of awards and did actually launch to positive reviews. In the game, players can choose from 5 different game modes and play on 15 different (and beautiful) maps including a two sided campaign. 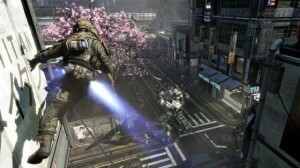 And, most importantly, players can play either on foot or in their large and extremely impressive mechs called Titans. Though this is a pretty short description, we’ll walk through a lot more details of what is or isn’t contained in the game below. Because I’d like to end on a high note and because I really do think that people should look favorably (but critically) at Titanfall, we will look at the negative before we get to the positive. The hype for Titanfall was huge due to all the awards it got and all of the commercials and other advertising that was presented. And, as Jim Sterling’s review points out, it really had no chance to launch and be the sparkling gem of perfection and revolution that the hype was claimed. At some level that is unfortunate because there are then inevitably many people that would be let down by that fact. But at the same time, I can understand that a company wants to sell its games and needs to gain attention. And for a multiplayer only game, it is critical to have as many people as possible playing the game. The hype also implied that the game was somehow revolutionary. That isn’t true. At its core, it is a FPS with pretty standard guns and abilities that have come up one way or another in the past. Robots or mechs are not new in video games. Maybe the combination is different, but a revolution seems lofty to call mixing two things together when there have been other multiplayer FPS games that at least had other vehicles (though I can’t actually think of one with mechs). Then the game modes all exist elsewhere. In Titanfall, they are called Attrition, Hardpoint, Capture the Flag, Last Titan Standing, and Pilot Hunter. Other than Hardpoint and Capture the Flag which are ripped straight out of other FPS games even in name, the others could be different. But they aren’t. Attrition is Team Deathmatch and Pilot Hunter is Team Deathmatch but you only get points for killing other players instead of a few for also killing the cannon fodder NPCs that wander around. Last Titan Standing is just a team deathmatch where everyone only gets one life (which is a simplified version of what Counter-Strike has been doing for around 15 years and might actually be able to be traced farther back). There is the multiplayer campaign though! This was also done by Brink before in virtually the same way. That sorta undermines the idea of it being new and great. But I think the campaign is so especially bad that it is worth ragging on more in a bit. For this, I strictly mean to discuss the amount of different content that comes in the box as compared to others in the field. One may be able to find an unlimited supply of fun in the game, but it will involve repeat experiences. And (excluding discounts), this comes at a full game price. The biggest point is simply that there isn’t anything beyond the 15 maps and 5 game modes (of which I argue that one is a repeat of another with a very slight scoring change). There is no single player. Well, technically there is the tutorial which you do by yourself (though you actually have to be online to even do that). I will admit that in games like Battlefield and Call of Duty, the single player campaigns keep getting shorter and more laughable in content, but they still can provide hours of entertainment and frequently a cinematic experience even ignoring replaying on tough difficulties. If we look at other functionally multiplayer games like the Unreal Tournament games, they technically had a single player campaign which was just a string of battles with specific AI opponents and allies. Additionally, they had the ability to play with AI players to practice or have fun or whatever (with or without other human players). Unfortunately for Titanfall, it is essentially an indie game pretending to be a AAA title. I say this because it is going to be compared to Call of Duty and Unreal and Battlefield which all have had many versions before to improve and they had a small team and a game engine to work with. I do love indie games overall (especially for the focus), but you tend to not want to take on the, well, titans of the genre as an indie. But if they want to pretend to be or actually be AAA, they do need to compete. The latest release of Call of Duty (Ghosts at time of writing), the logical competitor , launched with around 17 game modes (though some are just slightly different versions of others) and then was updated to add, I believe, 2 more for free. Titanfall has promised at least one new game mode for free in the future, but 6 versus 19 is a bit one sided. Ghosts did only launch with 14 (15 with preorder bonus) maps, so that is much more competitive. Battlefield 4 launched with 12 game modes and 10 maps making the playing field closer again. What is a bit sad to think about though is to compare any of these games to Unreal Tournament 2004. By having previous installments and a community that built maps, modes, and mods, it was able to launch with 11 distinct game modes, more than 100 maps, and a bunch of mutators (essentially unique rules changes) that could spice up any game mode. And then it also technically had singleplayer. And it had a modding and mapping community meaning that people could easily get even more for free. This one I find rather sad for a few reasons. Primarily, the way that the multiplayer campaign was implemented (as in grabbed from Brink or just a normal game mode/map with some voice over periodically) is terrible all around. The characters are meaningless voice actors that I have no connection to as a player. Everything they are saying has no actual bearing on the match, and worst of all, is that it is very easy to be busy (you know, playing the game) and not ever have the opportunity to hear the efforts at a story. In the end, it turns into just a series of matches that have some extra noise for some reason that you play because it’s the only way to unlock two of the Titans. Then we have to talk about the story… or lack there of. This is somewhere I find sad as well because Jesse Stern has shown that he is a capable writer. The story in Call of Duty 4: Modern Warfare was great. I admit the sequel really started going off the rails by the end (and the general character…), but it was still pretty passable especially if you didn’t look too close. Here there is sort of a battle between a big evil company that wants to enforce peace possibly with exploiting people on the outer edges of the galaxy and then a “scrappy” militia of the people being exploited fighting for their rights. I have to quote scrappy because they seem extremely well armed for not having any major backing (how do they have an infinite supply of titans?). And it never seems to get any deeper than that. Something infuriating is the fact (I guess spoiler warning if you really care; I’ll be done by the end of the paragraph) that all the battles end one way. The militia wins. I don’t mean that the matches are rigged and the IMC (the big company) cannot actually win. I just mean that the story is that the Militia wins every battle. This means that winning as the IMC feels pointless and honestly demoralizing. The first time that happened to me, I honestly just wanted to finish the campaign so I could go play a different game mode because I found no fun in playing a story where I cannot affect it (beyond there being a script, saying you are victorious but it didn’t matter is just insulting). And I think they could have done better. Unreal Tournament had a game mode called Assault. These were essentially missions where there were attackers and defenders. There was a series of objectives the attackers had to preform while the defenders tried to stop them. These were frequently straight forward things such as getting to buttons to open doors or blowing something up. As the mission progressed, the defenders were given better positions to spawn in, better supplies, and the attackers had farther to go from the spawn point. It was still possible to win, but each point got harder. In Assault, the teams switched sides after completion and either the new attackers had to win faster or get farther in the level to be called the winners of the match. This would have been a great game mode. There could have even been the big set pieces that modern games love to have at each point to have a cool spectacle. And it could have been fun as a separate game mode. A campaign of attrition and hardpoint games strung together just makes me want to play those game modes at best instead of making it something more. I’ve already given the spoiler that I like the game. It really just comes down to having fun, but there are reasons why it is able to be so fun. There is a lot that has gone into making sure weapons all the players carry have different advantages to the point where none really feel overpowered. The upgrades that are unlocked often have a trade off (such at a silencer makes you not appear on the minimap when you fire, but the range and damage go down), but even the upgrades that don’t (more ammo per clip for instance) tend to not be required. They do provide variety and some personalization to play style, but even the starting weapons are good. quicker than just waiting to kill another player. It’s a success reinforcement loop that helps to keep you in the game the entire time. The NPC fodder also get in the way. At a quick glance, it can sometimes be harder to identify who are the actual players and who are the NPCs in the room. This can allow a player to sort of blend in a bit (and cloaking is even better). This is a great experience even when you make mistakes about targets because threat assessment becomes a skill in a real way that just feels good to get right. And the giant robots are strong. But they are slow and much less maneuverable making them vulnerable as well. The combination makes them desirable without game breaking. Additionally, in modes like Capture the Flag or, my favorite, Hardpoint, there are many places that are important that the Titans cannot get to. And there is a way to just jump on an enemy’s Titan and use whatever small gun you have to destroy it from the inside out. Balance probably came from extensive play testing. The maps also show that attention to detail. There is a variety of places that favor pilots (players not in their Titans) or the Titans differently. Even clever areas to hide are always still vulnerable. Getting around the maps feels like it was extremely deliberately designed to provide a ton of options. If there is a threat you don’t want to face, just go around. This provides a location based strategy even in modes that force pinch points (CTF and Hardpoint) while making it so people tend to always have some direction they can’t see and therefore are vulnerable to. Sometimes that is straight above them, but that doesn’t mean it isn’t a direction of attack. And there is a variety of feels to the different areas. I’m not going to say they are exactly colorful past the browns and greys that permeate modern shooters, but they at least provide you with the spectrum of browns and greys while feeling very complete and cohesive. They also maintain all of the freedom of movement without feeling either too big or two small. There are edges to get around the main areas, but they are only a few second run from the center of all the action on the map. This makes everything seem possible throughout the missions instead of realizing that you spawned too far away to do any good or too close to the action to survive (though there is a bug, in my opinion, in Smuggler’s Cove where the spawn near C can be camped very successfully by a Titan of the other team, but I digress). he drop on enemies. You get a double jump so you can travel in many maps primarily on roof tops. And when combined together you feel like you really are an awesome character. And none of the movement gets in the way of the underlying shooter. The maps give you places you can go and you can seamlessly get in and win firefights while doing it. It really makes the game feel much faster and more fluid than a lot of other shooters. This isn’t really unique to Titanfall, but it is super important. Other than delays in matchmaking, getting into a game and getting to play happens quickly. The flow from wall running even before you see enemies gives you things to do or shooting the NPCs early. And then the game will take off and stay at 11 until it is done no more than 15 minutes later. This is great for when you have some time to play but not a ton (which I run into a lot). And you don’t need all of the weapons to be unlocked. It is even possible to get one-time-use cards to play with weapons you don’t have unlocked yet. And you can do very well even with just the default titan. Nothing really feels required to have a good time. In the end, is Titanfall a good game? Yes. What it does, it does very well (I don’t think it really does narrative for reference; it could, it just hasn’t yet). 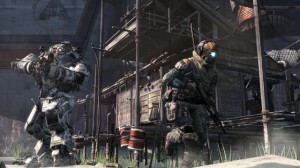 It is somewhat of a limited target with the required and only internet play, but if online multiplayer FPS sounds fun, Titanfall can provide. I would recommend it highly. But it is far from perfect. Maybe Titanfall 2 will address a lot of these concerns and really set a new benchmark for FPS, but that remains to be seen. 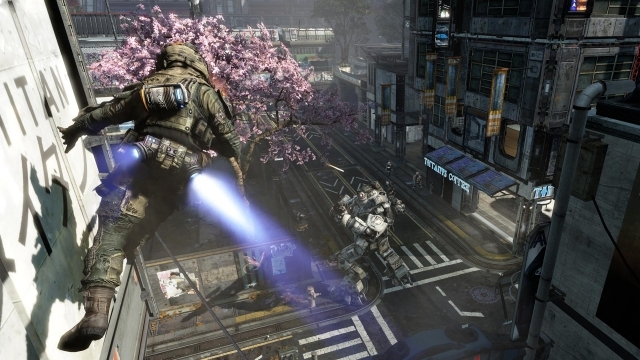 The focus in Titanfall is very good, and in the end, it is just a blast to play. As a game, I see no shame in that being its bottom line.